September 14, 2017 September 14, 2017 • Glenna G.
How do The Traveling Geiger and I spend a 3 day weekend? Exploring new parts of the state, of course! 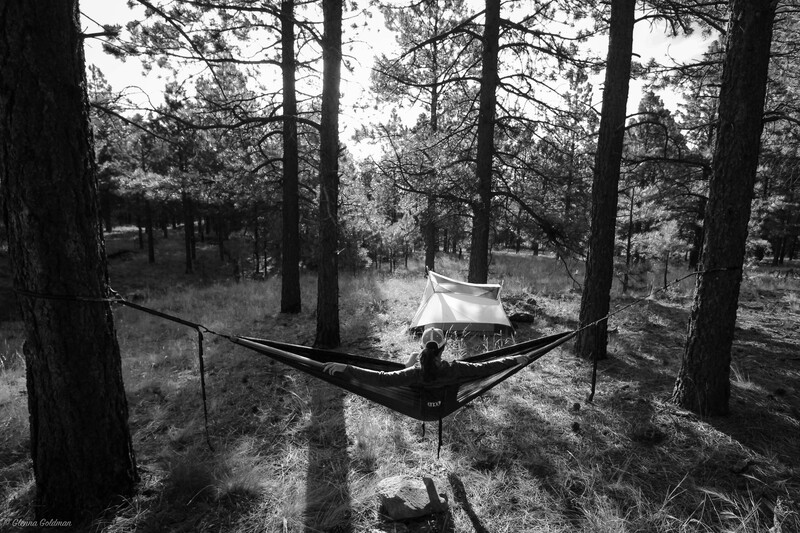 Jake planned a trip up to northern Arizona to visit some Ancestral Puebloan cliff dwellings, drive around some monumental rock formations, and have a little hammock time (because after a year living in Phoenix, I REALLY miss trees). Friday after work we filled our water bottles with ice and braved the 100+ degree drive up toward Flagstaff. Despite slow traffic due to the terrible Arizona drivers, we made decent time. The moon was almost full, and the desert was bathed in an eerie silvery glow. We finally arrived at Navajo National Monument (about 5 hours from Phoenix), and drove straight to the main campground. 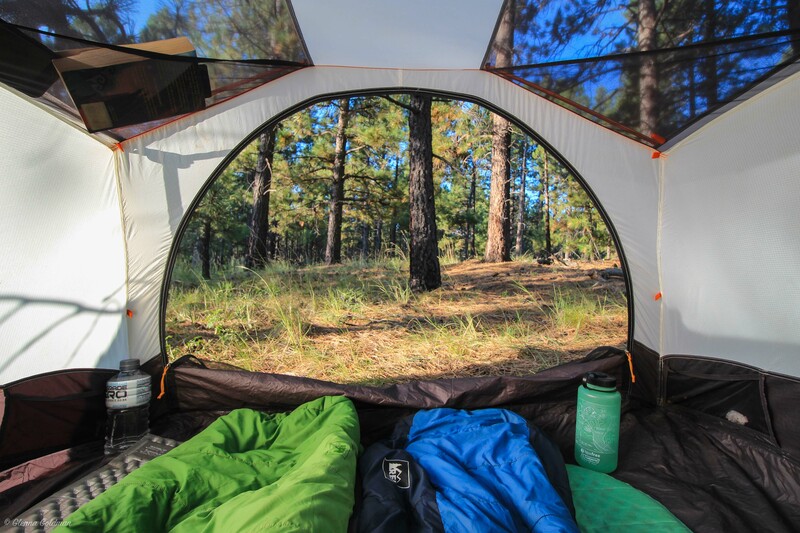 Entrance and camping at this park is free, as part of the lease agreement with the Navajo Reservation. We put down our tarp and sleeping bags, and fell into a deep slumber. We were sleeping quite peacefully until someone began slamming car doors and speaking very loudly. It was barely dawn, so it must’ve been about 5:30 in the morning. After half an hour of loud conversation and door slamming, I was fed up. I walked a ways down and across the road, following the sound of the voices. 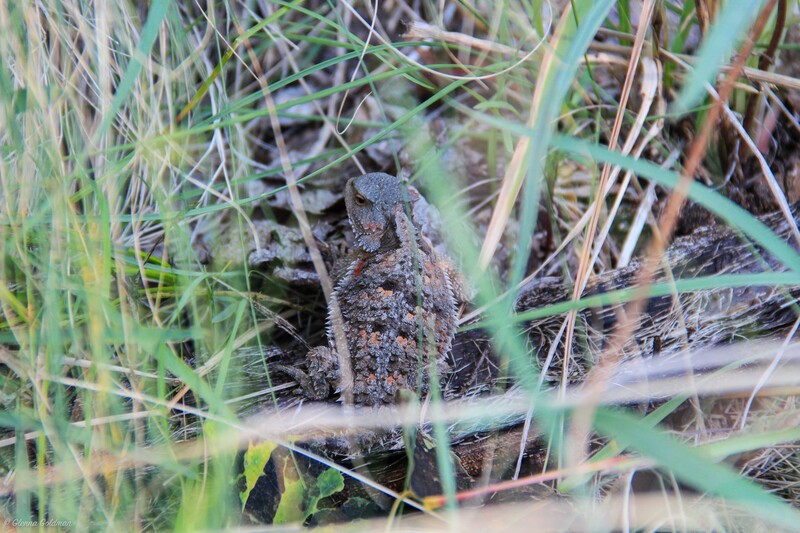 The noise was coming from a group of 3, and I asked them politely if they could please be a little quieter. I was absolutely shocked when they yelled “NO! You were very loud last night so we will NOT be quiet!” in some foreign accent that I couldn’t place. I was absolutely flabbergasted. I’ve NEVER encountered such rude people while camping. They didn’t know which campsite I came from, as most of the sites were surrounded by trees. And even if I was the one making a lot of noise last night, why would you punish an entire campground full of people as revenge? I thought about TPing their car, but after another half an hour of rudeness, they left. I hope karma (or a really big Arizona redneck) teaches them some kindness. Thankfully, the rest of our day made up for the rude campers. I convinced Jake to get up and find a spot at the other campground, which was more secluded and scenic. We arrived at the Visitor’s Center at 8 am for a guided hike to Betatakin, an Ancestral Puebloan cliff dwelling at the bottom of Tsegi Canyon. Our guide was Navajo, and she was very knowledgeable about the local history, plants, and customs. She stopped along the 1.5 mile hike to tell us stories about her people and the ruins we were about to see. Countless other dwellings existed here around 1250, but only 3 were protected and preserved by their sandstone alcoves. 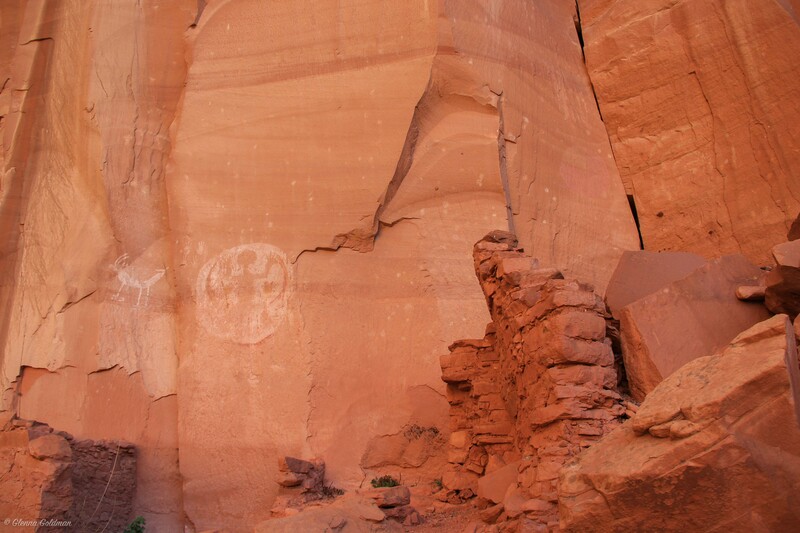 The other Ancestral Puebloan cliff dwellings in Navajo National Monument are Keet Seel, which you can hike to with a free permit, and Inscription House, which is inaccessible. Although this hike was short in mileage, it took us a very long time to get to the bottom. These steep steps were built in the WPA era, and they’ve held up remarkably well. However, I wouldn’t recommend this hike if you’re afraid of heights, as there is no railing between you and a very steep drop. We took a short break before entering the overhang with the cliff dwelling. As we hiked closer to the dwelling, the air cooled a few degrees, and a peaceful quiet settled over the group. Betatakin took my breath away, and I don’t think I was the only one. We stood at the base of a dirt trail leading up to the ruins. Unfortunately we came a few years too late to venture into the ruins themselves, as they have been deemed too unstable for visitors. 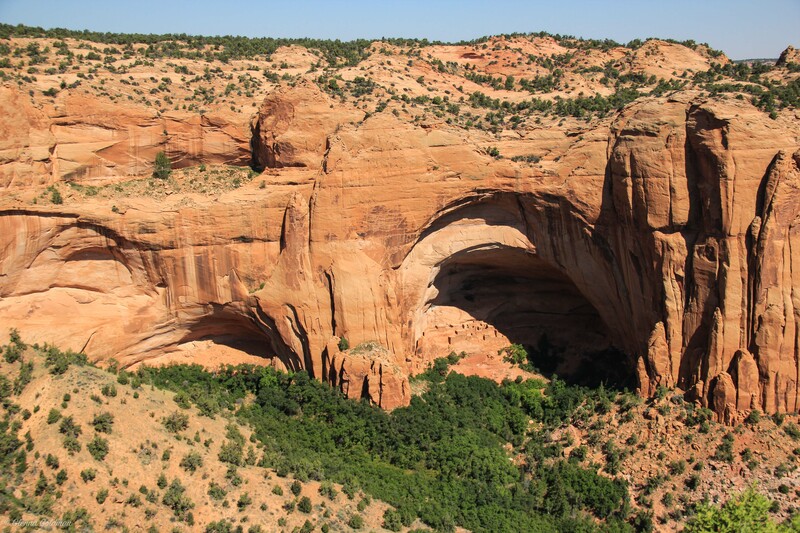 Betatakin is a Navajo name meaning “ledge house”. Talastima is the Hopi name for Betatakin, meaning “place of the blue corn tassels”. This dwelling was occupied from about AD 1250 to 1300. You can still see the original timber roof beams and masonry, which I think is simply astounding. Our guide explained that the inhabitants would get around using the ladders (pictured above), and large granaries were built above and beside the dwelling. Their agricultural fields were located on the canyon rim and floor. There was a spring gurgling just to the right of the dwelling, which was likely the main source of water for this village. After admiring the cliff dwelling, we hiked up a small ridge along the side of the canyon to see petroglyphs, carved into the rock and preserved by the overhang. Below you can see what appear to be bighorn sheep. Our guide said they are facing different directions with a small dotted line connecting them to represent their migration patterns. 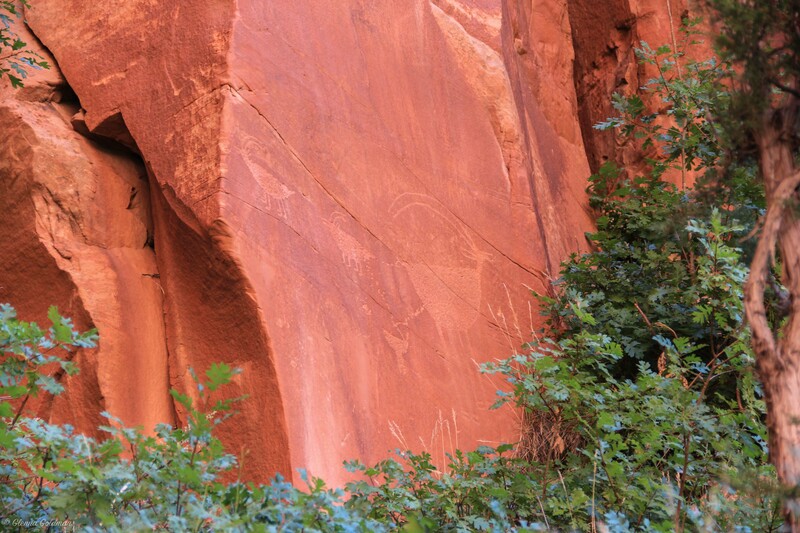 Here you can see the four clan symbol pictographs, which represented the people who lived here. To the left are the Deer Clan and the Fire Clan. To the right you can faintly make out a pink pie chart sort of drawing, which represents the Flute Clan, and a white swirl which represents the Water Clan. According to Hopi tradition, these were their ancestors. 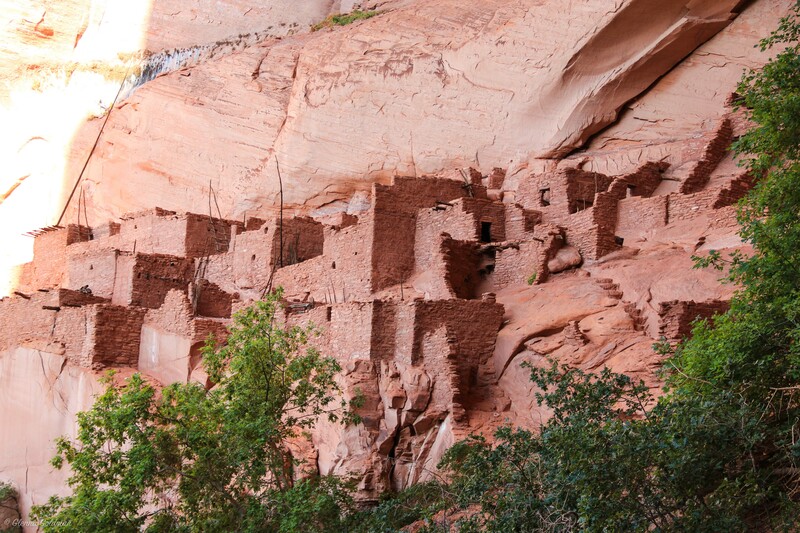 Like all Ancestral Puebloan dwellings (including Mesa Verde), no one knows for sure what happened to make these people leave the villages they worked so hard to build. The most common theory is drought, forcing the people to find land with more resources. At Betatakin, some of the rooms were bricked up, and full of goods. Did they do this for ritual purposes? Were they planning to come back? We may never know. After admiring Betatakin a bit longer, we took the steep path out of the canyon. It’s a quad buster, to be sure! Once we got to the top, we took the short, paved Sandal Trail to an overlook. It was cool to get 2 different angles of the dwelling. I would highly recommend the guided hike. After refilling our water bottles at the Visitor’s Center, we got back into the car to visit Monument Valley. 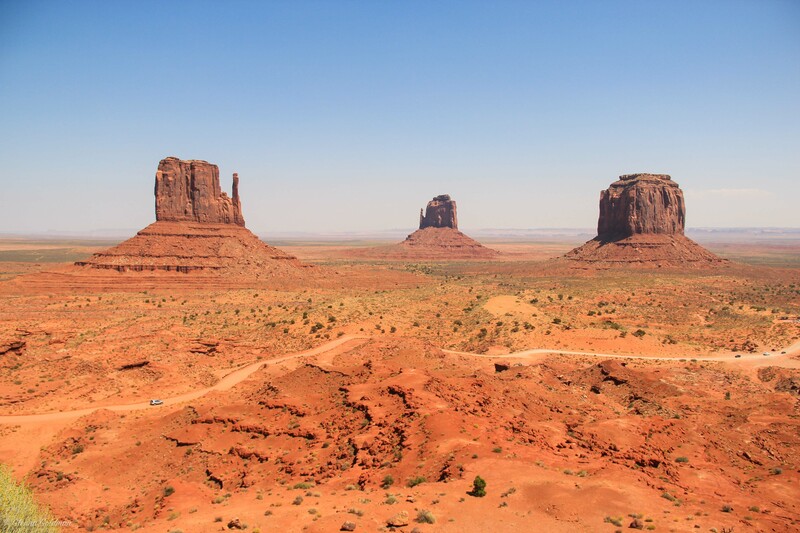 We forked over $20 to visit this iconic spot, which is a Navajo Tribal Park, not a national park or monument. The Navajo name for this area is Tse’Bii’Ndzisgaii. Most of the valley is inaccessible, unless you purchase an off-road tour. We did the lollipop drive, which travels out past a few monuments and plateaus. We made it in the Camry, but just barely! I really wouldn’t recommend this drive unless you have a high clearance vehicle. We were surprised to see that some people actually live on this arid land within the park. Jake did a short hike with a guy we met along the way, but it was about 95 degrees – too hot for me! I sat at the restaurant, which had a phenomenal view of the valley, and chatted with some Minnesotans who now live in Tucson. You may recognize these landmarks from several films, including Stagecoach and the new Lone Ranger. Of course we had to get the iconic “Forrest Gump” shot, although it was very hazy. Thanks for the photos, Ryan! On our way back to Navajo National Monument, we stopped in Kayenta to check out the Code Talkers exhibit, which is oddly in a Burger King. We heard that the owner’s grandfather had been a Code Talker, so the museum is partly dedicated to him. I have to say it was the nicest Burger King I’ve ever been to, and the exhibit was decent for being installed in a fast food restaurant! 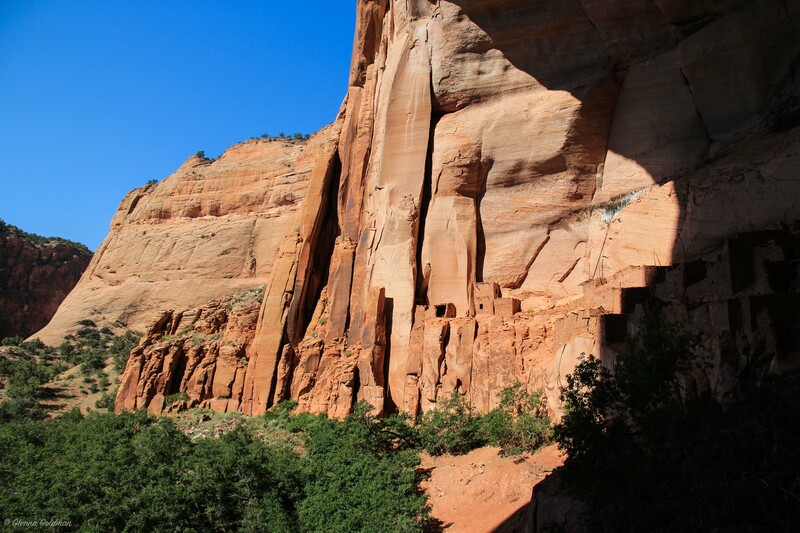 The next morning we were going to do Keet Seel, the only other hike in Navajo National Monument. We had our permits and everything, but Jake’s keys got locked in the car! Luckily our new friend Ryan was camping with us, so he drove Jake to the Visitor’s Center. The maintenance guy had some tools to help us get into the car (Jake can cross breaking into a car off his bucket list), but by the time we got in, it was too late to start the 16 mile hike. So, we made the best of it and headed to Flagstaff! 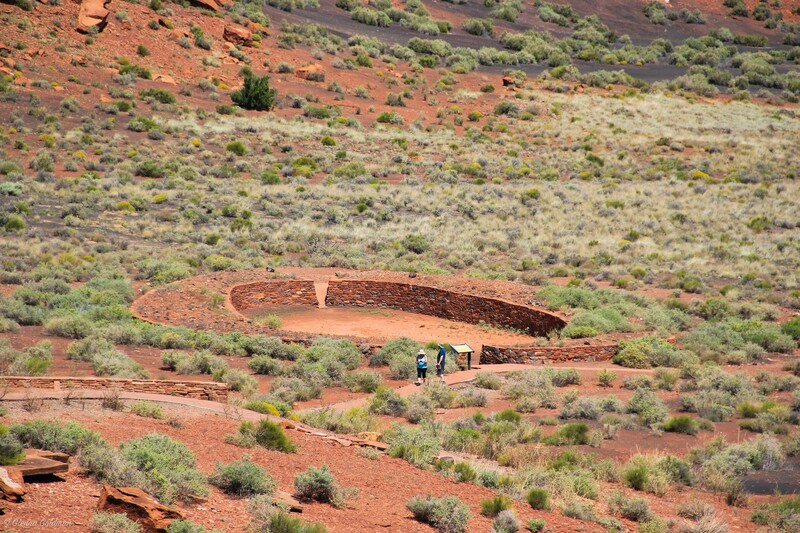 Wupatki is a loop drive northeast of Flagstaff. We stopped at Citadel Pueblo, reading all of the signs and climbing into the ruins (don’t worry, it’s allowed!). We drove along to the Visitor’s Center, where we were given a booklet to read as we made our way around the ruins. 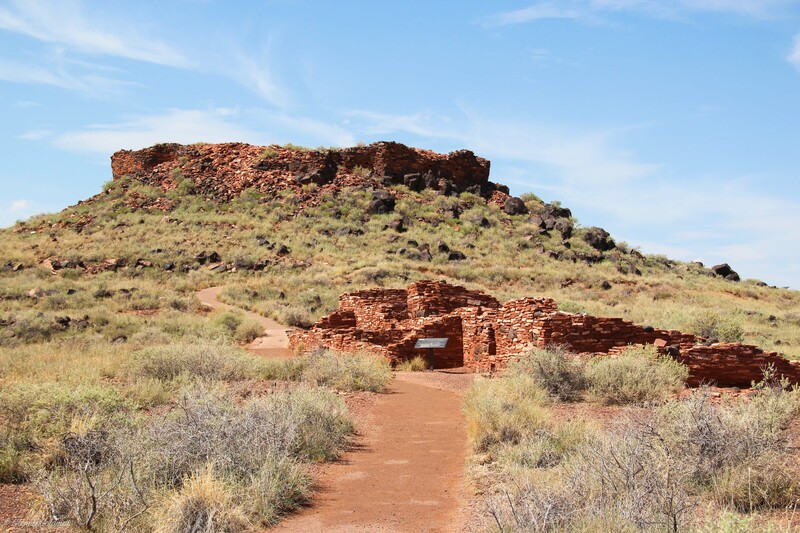 Wupatki was inhabited between 1100 and 1200. The village had about 100 rooms, a ceremonial ballcourt, and a large plaza and community room. It was located near an ancient crossroads, and was likely an important spot for trade. 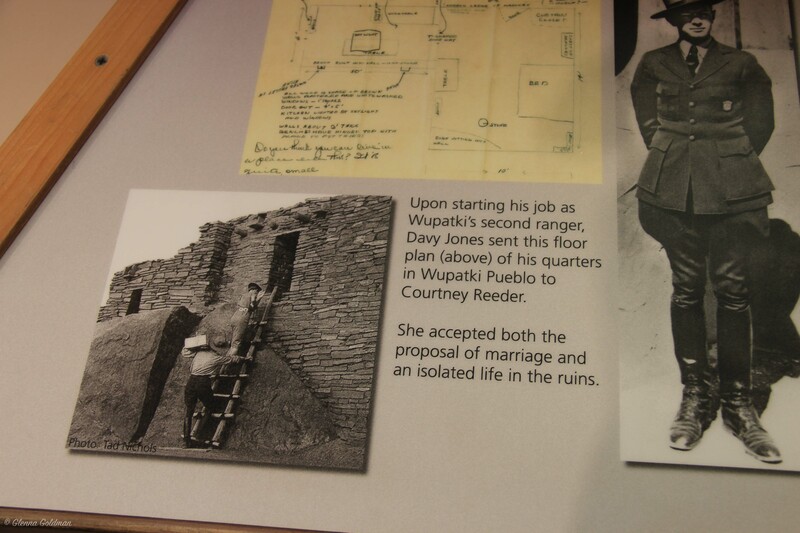 I was very surprised to learn that some of the first custodians of the park lived in the ruins! And I have to say, Davy Jones found a keeper. Next, we drove the rest of the loop to Sunset Crater, an ancient volcano that erupted while people still occupied Wupatki. The native peoples have many legends about the volcano. After we’d had our fill of history, we headed into the hills of Flagstaff! 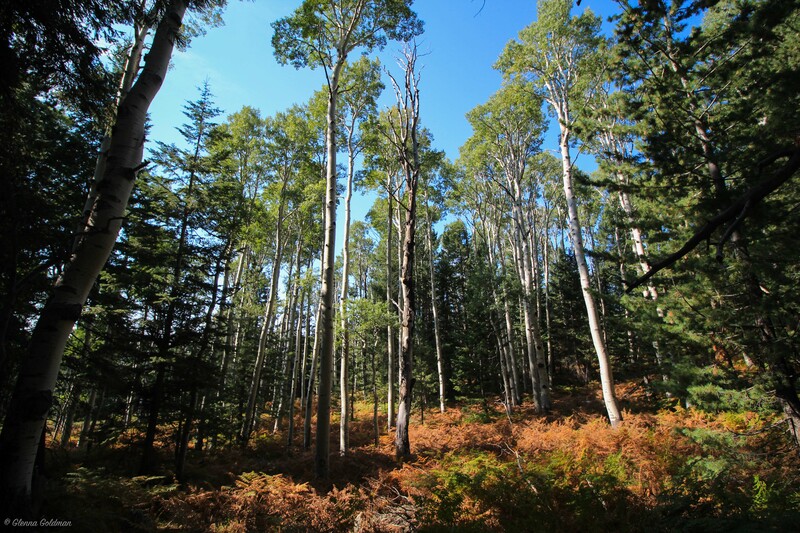 At long last… TREES!!! You can only imagine my joy when I was FINALLY able to hang up my hammock and swing in the cool breeze. Jake and I found a nice spot off a forest road, where we enjoyed the weather and read our books in blissful silence. We met some wandering mushroom hunters, a father and son who had made a day trip from Phoenix just to collect some bright orange Lobster mushrooms. Jake and I always thought brightly colored mushrooms were deadly, but it seemed like these guys knew what they were doing. Google them, because they are WEIRD. We took a short walk up a mountainside fire road, stumbling across some trail riders and their horses. After returning to camp, we had a dinner of baked beans, and fell deep asleep under the stars. We grabbed some granola bars, then packed up camp and drove to the nearby Shultz Pass Trailhead. After a few miles of uphill slog, we came upon a large aspen grove and fields of colorful wildflowers. After we’d had our fill of hiking, we headed back to Phoenix (aka The Oven). It’s still 100+ every day, so I’m glad we’ll be leaving very soon for Europe! Next up, we’ll be traveling The Danube on a Viking River Cruise! Posted in Hikes, Outdoors, Road Trip, Travel BlogTagged Hiking, Nature, Road Trips, Travel, Travel BlogBookmark the permalink. 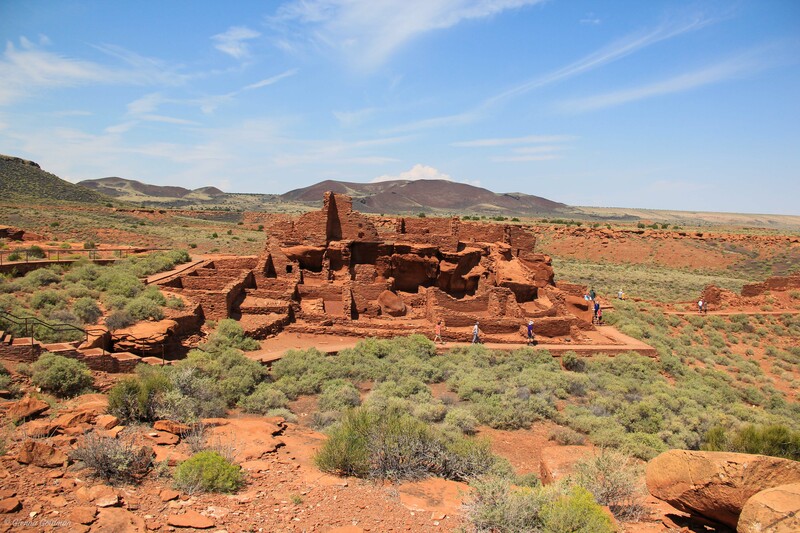 Visiting the Wukoki ruin in Wupatki as a kid is probably the moment I fell in love with the national parks. You’re lucky to have grown up in the West!